It is important to note giving your readers the story that Fico 08 has been delayed indefinitly due ot the lawauit that Fair Isaac has filed against the 3 major credit bureaus for a breach of contract. The most likly story is that Fico 08 will not be unvailed till late 08. 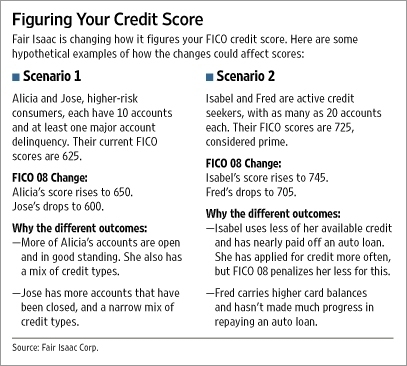 "...FICO 08 is likely to face some competition from VantageScore Solutions LLC of Stamford, Conn., a joint venture of the three credit bureaus that was rolled out in 2006. Fair Isaac has sued VantageScore and the three bureaus, accusing them of using unfair and anticompetitive practices to harm the FICO brand. Recently, Equifax linked the suit with the launch of FICO 08. The company has said it wouldn't move forward with FICO 08 and that its relationship with Fair Isaac remains "strained" until the lawsuit is resolved, says David Rubinger, Equifax spokesman. The new FICO model has already been distributed to Experian, which is in the process of implementing it, while TransUnion expects to have the scoring model available for lenders to test during the second quarter of 2008. Fair Isaac says its intention is to provide the formula to all three credit-reporting agencies."